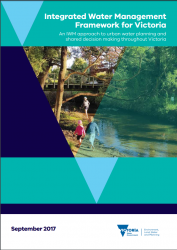 The Victorian Department of Environment, Land, Water and Planning (DELWP) has just released the Integrated Water Management Framework for Victoria (IWM Framework). The IWM Framework supports the implementation of Water for Victoria and aims to help government, the water sector and the community work together to better plan, manage and deliver water in Victoria’s towns and cities. The framework emphasizes how to consistently collaborate and plan to realise greater benefits to the community. It's the first time in Australia that a systematic approach has been designed and promoted state-wide. Check out the IWM framework.